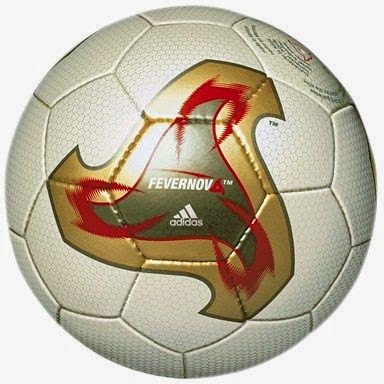 The adidas Fevernova TM was made for the FIFA Korea Japan 2002 World Cup. The outer layer of the new ball was 3mm thick and consisted of a combination of special synthetic polystyrenes (polyurethane) and natural rubber. Within the 11 layers included a foam layer made up of tiny gas filled balloons which gave the ball added elastic properties. These were cleverly embedded within the layers, equal sized, highly elastic, and exceptionally resistant gas-filled microcells. The layers were tightly woven in a network of knitted, synthetic Raschel fabric. The ball was constructed from syntactic foam based on abrasion resistant polyurethane made by Bayer called Impranil® polyurethane. The sponge had high modulus of compression, with a good elastic memory. The outer layer of the ball could withstand exceptionally tough treatment. The surface of the ball converted applied energy evenly at every point thus damping properties to the kicker. Technically at the feet of experts this might, as the manufacturers claimed, limit deformation when the ball was kicked and give a more calculable, flight path. Distortion of the round shape leads to an uneven airflow around the ball making it veer off course. Laboratory tests showed the adidas Fevernova TM could travel at speeds of 130km/h (81 mph). The new, FIFA World Cup 2002 ball weighed 435g, and was made to meet the lower end of FIFA regulations governing circumference and the upper limit of weight, Scientists believed the smaller and heavier sphere would a more accurate trajectory (Murphy, 2002). The outer coating of the ball was made of polyurethane and coincidently facilitated incorporation of intricate designs. During competition despite some spectacular goals the ball was heavily criticised for being too light. 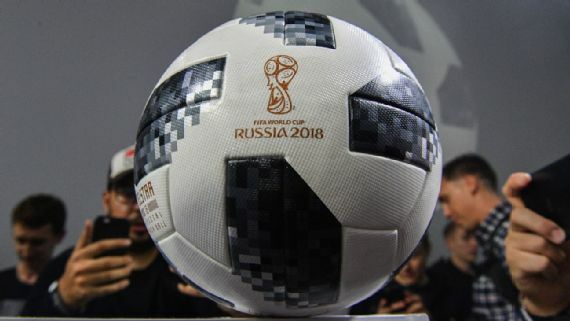 The official World Cup official ball appeared to exhibit the same properties as the commoner garden plastic inflatable balls. The adidas +Teamgeist was introduced at the FIFA World Cup Germany 2006 . The truncated octahedron shaped ball had 14 curved panels rather than the 32 that have been standard since 1970. The radically new configuration reduced the amount of panel touch points forming a smooth and perfectly round exterior that improved accuracy and control. The +TeamGeist panels were bonded together to make the rounder shape and like its predecessor manufacturers the ball would perform more uniformly regardless of where it is hit. The manufacturers also claimed the ball was waterproof. The new +Teamgeist was extensively tested at Loughborough University and the adidas football laboratory in Scheinfeld, Germany. The ball was designed by the adidas Innovation Team and the Molten Corporation and had the traditional colors of the German flag and was accentuated with the golden color of the World Cup trophy. Match balls for the 2006 FIFA World Cup were personalized with the name of the stadium, the teams, the match date, and the kick-off time of each individual game, under a protective coating. Plans to make this the first intelligent ball were eventually abandoned. All 32 qualified federations received 40 match balls for training purposes. Once again the ball was criticized by many top players before the World Cup claiming it was too light and had a vastly different performance when wet. The adidas Jabulani was introduced at the FIFA World Cup 2010 South Africa. The ball was made from eight spherically moulded panels and had a textured surface intended to improve aerodynamics. This was six less panels than the + Teamgeist but these were spherically moulded from ethylene-vinyl acetate (EVA) and thermoplastic polyurethanes (TPU). The outer cover was glued tightly together forming a perfect sphere. The surface of the ball was textured with grooves, a technology developed by adidas called "Grip 'n' Groove" to improve the ball's aerodynamics. The new ball was again developed in partnership with researchers from Loughborough University. The ball had four triangular design elements on a white background. 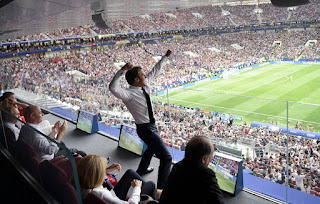 Despite in situ wind tunnel testing at Loughbrough University and scientist s’ claims the ball was the most "consistent" football ever manufactured many players were disappointed with the competition ball. The speed of the ball made it difficult to play, the path of the ball through the air was unpredictable, and goal keepers found it awkward to handle during games. 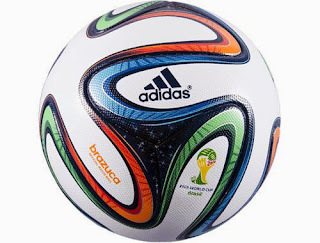 The official ball of the 2014 FIFA World CUP Brazil is the Brazuca. Concerned at the criticisms of previous World Cup balls the manufactures have tried to produce a competition ball which demonstrates constant and predictable flight paths. The Brazuca has six thermally bonded propeller-shaped panels, less than the eight of the Jabulani, the 14 of the Teamgeist or the 32 of traditional footballs. Adidas claims the new seam geometry will give the ball aerodynamic accuracy and a stable flight. The bladder of the Brazuca ball is made of latex and provides the desired rebound. The ball is also textured and more aerodynamically sound than any of its predecessors. The Brazuca has different seam geometry than the Jabulani ball with the former longer and deeper. This makes the new ball behave more like the traditional football but when combined with the villi like nub textured outer surface gives a "knuckling effect" causing the ball less spin in flight as it travels further. Experts believe to get the best from the new ball players should be prepared to not kick the competition ball too hard. At the 2002 tournament the Fevernova was deemed too light; four years later the Teamgeist was judged too heavy. 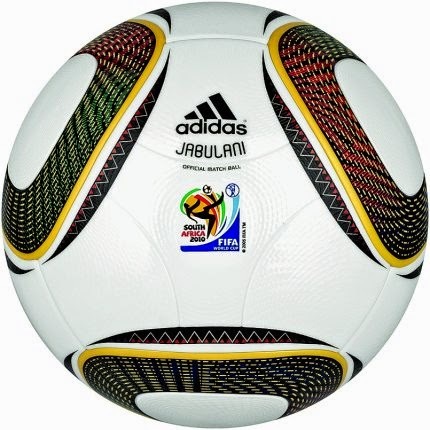 The smoothless Jabulani was considered the worst competition ball of all because it was unpredictable in flight. The Jabulani knuckled (wobbled) in the air at speed, following an unpredictable flight path. The Brazuca has deeper and longer seam between the panels than its predicesor the Jubulani, and behaves more like the traditional, hand-stitched football. Researchers at the Centre for Sports Engineering Research at Sheffield Hallam University measured the seams of the Jabulani and the Brazuca, determining that the Jabulani's seams are about .48 mm deep compared to 1.56 mm for the Brazuca. The seams on the Brazuca stretch to 327 cm, compared to 203 cm on the Jabulani. The previous smoother ball designs decreased friction making it harder for players to put a spin on the ball. Unlike previous years all 32 national federations competing in the World Cup were given the opportunity to practice with the ball six months prior to competition . 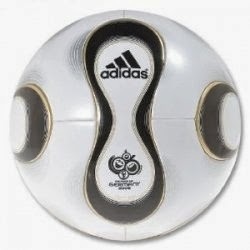 Previously only adidas sponsored teams and players were given early exposure to competition balls. The Fevernova and Jabulani both gave keepers particular problems because of the completely unexpected behavior of the flighted ball. Experienced outfield players were quick to master ball control which game them a big advantage in previous competitions. The adidas Telstar 18 has a distinctive new design and contains the bio-based sponge rubber layer of EPDM rubber Keltan Eco, from Arlanxeo. This serves as a moldable cushion for the ball and supports bounce characteristics (elasticity and resilience) during play. Keltan Eco is manufactured using bio-based ethylene extracted from sugarcane. Keltan Eco 6950, used by Adidas, is characterized by its amorphous structure and high crosslinking density. This leads to good low-temperature properties and meets the requirements for elasticity and resilience. 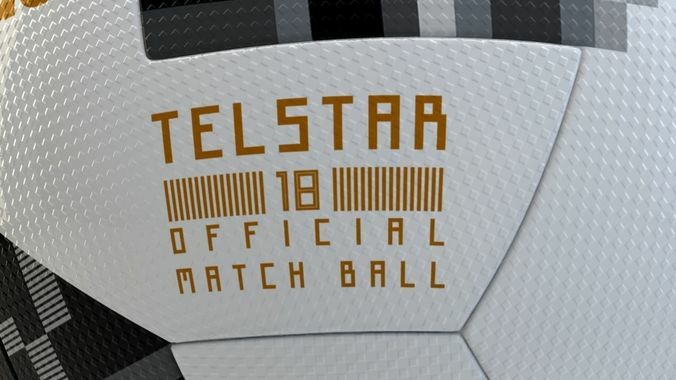 As an novelty, there is embedded under the skin of the Telstar18 is an NFC chip that will allow users with smartphones to interact with the ball. When interacted with, the chip will unlock exclusive content and information for the user, including World Cup competitions and challenges, plus more features will be added in the lead-in to Russia. Each new FIFA World Cup TM ball goes through many trials on the way to the centre spot. Players from leading nations and clubs including Argentina, Colombia, Mexico, Manchester United, Real Madrid, Juventus and Aja (usually sponsored by adidas) are allowed to train and play with the ball. Whilst most of the reviews have been positive, the adidas Telstar 18 Ball has also come in for criticism from several goalkeepers. The ball appears ideal for strikers but for those who have to second guess its speed, trajectory, bounce and try and stop it, it’s a nightmare. Like previous criticism of new World Cup ball designs the adidas Telstar 18 takes unexpected flight paths when kicked. According to Spain’s Pepe Reina, the plastic film which covers the ball hampers goalkeepers from comfortably handling. .
Whatever may be said about the Adidas Telstar 18 used to open the 2108 FIFA World Cup TM Russia it is certainly the widest travelled because the new ball has been taken on a trip to space on an international mission to the International Space Station ISS about 400 kilometres above the earth. It will make its return to Earth when cosmonaut, Anton Shkaplerov lands well in time for the opening game on the 14th of June in Moscow.